Billie hangs from the bar moments after her very first dead-hang pull-up! “I did it!” Erin “Billie” Billingsby on the achievement of her first pull-up. 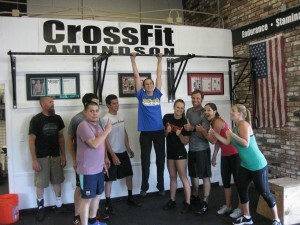 If you are planning on joining CrossFit Amundson for the Run & Swim on Friday, August 3, 2012, make sure you register by July 31 by signing up at the gym. The cost for team registration is $40.00 per athlete. Please provide payment to any trainer at the gym or you can have your card on file billed automatically.